Indigestion, cramping, bloating, constipation. We all experience these things from time to time, and they can be absolutely no fun. We all know that yoga asana is great for helping back pain, stress relief, increasing oxygen intake, as well as being awesome for mental health...But did you know that yoga asana can also be a tool to help improve your digestive function? Yoga asana offers several postures that help cleanse, stimulate, aid, and encourage good digestive function. It’s best not to practice yoga right after a meal, but if you’re feeling any kind of bloating, gas, or indigestion a few hours after a meal or the morning after, here are five yoga postures to improve digestion. Yogi masters say that if you practice this pose consistently, you’ll be able to eat anything you want and have perfect digestion. During the pose, you’ll place pressure on the digestive organs by balancing the weight of your torso on your arms, which will cut off blood supply to the digestive organs for a moment. Then, when you release the pose, lots of fresh, oxygen-rich blood will flow to the digestive organs and improve their function. The compression will also help move anything through that may be stuck. This pose is awesome if you struggle with sluggish digestion, or if you have trapped wind. Take this pose slow, and be sure to combine it with your breath; exhaling as you draw your knees into your chest, and inhaling as you allow them to flow away. I also recommend practicing this one before going to bed. 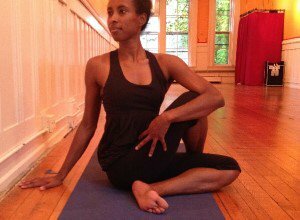 Twists in general are so helpful for improving digestion, and Ardha Matsyendrasana is no exception. It has a specific ability to cleanse the digestive system. While you are twisting, you are reducing blood flow to the digestive organs, so when you release, you're letting in "new" blood to the digestive organs. You can also think of twists as having the same effect on your digestive system as twisting a cloth—you will be wringing out the toxins. Paschimottanasana is amazing for stretching and lengthening the back, but did you know that if you add a little prop to it, it becomes a great digestive aid posture? By placing a bolster or pillow on your thighs, and allowing your belly to rest upon it when you fold forward, you’ll be creating space for a digestive massage to take place. Each time you take a full inhale, the bolster or pillow will resist against your belly, causing a compression. Then, when you exhale, you release the compression, creating new flow to the area. Repeat this breathing into the bolster or pillow as many times as feels comfortable for you. 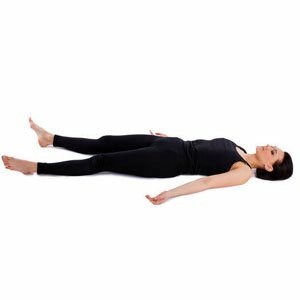 The ultimate posture for all healing is Savasana. When you’re at rest, you’ll be tapping into your parasympathetic nervous system. This is also knows as your “Rest and Digest” response. As you lie still, you're allowing all stresses to melt away and you’re literally creating a healing environment for your body. Your blood will start to flow away from your extremities and towards your digestive organs. Your heart rate will slow, and your breathing will deepen. All of this increases oxygenation to the digestive organs. This also creates the ideal environment for digestion, cleansing, and healing. So, the next time you’re faced with digestive upset, give some of these postures a try! You may be surprised how well they work!